“And this is the answer to all the riddles: growing up is giving up. When you get there, you will know it. It is giving up your vast dreams, your lively freedom, your marked-up maps, your own way, your own notions about the way things are, and the way they should be. It is a bowing of the knee. 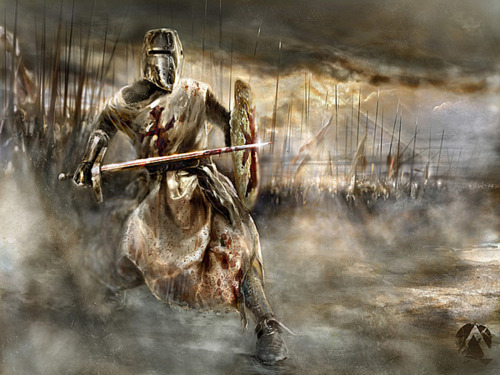 And when the boy has bowed his knee before the throne of the sovereign, it is then that he feels the scepter of the sword come down on his shoulders and rises a knight, a slayer of dragons, a man of action. Because most of all, growing up is an action.” Dangerous wisdom unless one has already begun to understand it, I think. There are some things that can be taught, but there are others that one must learn on one’s own to really understand them. You are wise beyond your years. Your children already blessed before they are born. Eloquent! Oh. My. Goodness. Im sorry to pop up like this, since you dont know me but this. Is. Genius! Never have I found such a writer who truly captures the heart and soul of what they are trying to write quite like you have. In fact, i kinda envy you. 🙂 But seriously, I am not only impressed, but also inspired! I especially like your design of your WordPress Blog. Im new to WordPress by the way, and so could i ask u a question? If you dont mind me asking, how exactly can you set up a really good account, one hat not only is attractive, but one that contains everything i wanna write about and one that looks nearly as professional as yours. Cos I wanna make a WordPress account entitled “All Things New” and Im having trouble with it. Any information would be fantastic! Thanks for reading and taking time to share your thoughts, Miguel! Regarding WordPress design, I would recommend doing some browsing and bookmarking sites you consider attractive. Then pick out what it is you like about those pages. What makes a page look professional and what looks tacky? Make a list if it helps you keep it straight in your mind. Simple, neat and easy on the eyes is the key :). Thanks for your kind words, Christina. I loved your idea of this post and it was inspirational! Your remarks about the noisy political world are spot-on: one reason I had to retreat a little from the chaos to a quiet place like this. Because the Kingdom is not of this world. I still write over at The Washington Times Communities pretty regularly, but find I enjoy this place much more. So much of journalism is hype, pageviews, hype, social media buzz, hype, image-building and hype. So little of it is about truth at all. We, of course, are changing that, but, for my part, I am finding everything is more and more about being the change you wish to see in the world, rather than just adding to the noise. His ways are not our ways, are they? I look forward to meeting you one day — if not here, then in the Far Country. Bryana, I first made your acquaintance through The College Conservative (for which I also wrote), before each of us resigned that opportunity in order to attend other responsibilities. I have always been an admirer of your work, especially because of your sensitivity to things spiritual and your ability to see beyond the political noise. I always counted it a shame that we never met -or have yet to meet, I should say- in person, but I am grateful for the technological happenstances that led me to your blog (I suppose through Twitter). I am often comforted and encouraged by your posts here. They are a testament to your devotion to Truth, Beauty, and Justice. You also have a unique ability to express yourself with language that seems almost lyrical at times, making my own online musings seem scattered and choppy at best. I do not know why I have waited so long to comment -perhaps because this “letter” has been one of the finer pieces I’ve read of yours- but the encouragement seemed to be demanded. It is difficult for morally conscious conservatives to stay connected and mutually uplifted; the technologically-forged bonds of community seem o so weak at times. Perhaps this has been as encouraging as I set out for it to be. Grace and Peace to you and your family.